Citation: Fair GL, Harris MF, Smith MM. Transition from an asylum seeker–specific health service to mainstream primary care for community-based asylum seekers: a qualitative interview study. Public Health Res Pract. 2018;28(1):e2811805. MH is a volunteer medical officer at the ASC, and a board member of the Central and Eastern Sydney PHN. GF was involved in conducting the literature review, planning and designing the study, collecting and analysing the data, and writing the paper. MS was involved in planning and designing the study, interpreting the findings, and reviewing and editing the paper. MH was involved in planning and designing the study, supervising the collection and analysis of the data, and reviewing and editing the paper. Background and aim: Transition of asylum seekers from special-purpose health services to mainstream primary care is both necessary and difficult. This study explores the issues encountered by asylum seekers undergoing this transition in Sydney, Australia. Methods: Qualitative semistructured interviews were conducted with nine asylum seeker patients and nine staff working in the sector. Results: Asylum seekers faced significant challenges in the transition to mainstream primary care. Contributing factors included the complexity of health and immigration systems, the way in which asylum seeker–specific services provide care, lack of understanding and accommodation by mainstream general practioner (GP) services, asylum seekers’ own lack of understanding of the health system, mental illness, and social and financial pressures. Conclusions: There is a need for better preparation of asylum seekers for the transition to mainstream primary care. Mainstream GPs and other providers need more education and support so that they can better accommodate the needs of asylum seeker patients. This is an important role for Australia’s refugee health services and Primary Health Networks. The transition from asylum seeker–specific to mainstream primary care has proven to be difficult in a number of Australian and international contexts.6 The transition is often complicated by a lack of coordination between specialised and mainstream services9, reluctance among patients to transition10, difficulties in medical record transfer11, and the vulnerability of patients from a refugee background.12 However, the literature is limited and mostly considers refugees alone. The relevance of these issues to asylum seekers has not been fully established. Significantly, the views of asylum seekers themselves have not been comprehensively explored in the literature. What knowledge, attitudes and experiences exist among healthcare providers working with asylum seekers about transition from asylum seeker–specific primary care to ongoing mainstream primary health care services? What are the views and experiences of asylum seekers making the transition from asylum seeker–specific primary care to mainstream primary health care services? Qualitative semistructured interviews were conducted with nine asylum seeker patients and nine healthcare providers working in the asylum seeker sector between April and August 2016. Healthcare provider participants were recruited via the professional networks of the researchers and asylum seeker–specific health service staff. Participants were interviewed in person by author GF, who obtained written consent, and recorded and transcribed interviews verbatim. Topics included the health needs of asylum seekers, perceptions of the transition process and suggestions for improvement. Asylum seeker participants were former or current clients of the ASC health service. Clients were invited to participate if they had been eligible for Medicare at some point and thus had transitioned from the ASC to a mainstream GP. Some clients had returned to the ASC because of loss of their Medicare entitlements. Purposive sampling was used to ensure diverse backgrounds and experiences. Clients were approached by an ASC nurse and informed about the study. Interested and eligible participants were interviewed at the ASC by GF. Verbal consent was obtained and handwritten notes were taken during the interview, rather than audio recording. This was agreed among the researchers to be preferable based on prior experience with asylum seeker clients, who could be suspicious of recordings and feel uncomfortable signing written documents. Participants who were known to clinic staff to not be fluent in English were offered an appropriate telephone interpreter; this was used in approximately half the interviews. Interviews focused on participants’ experiences of primary care and transition between services. Interviews were carried out until thematic saturation was achieved. Descriptive qualitative methods were used to analyse the data. Transcripts were coded using an inductive approach to produce a list of themes with the aid of NVivo qualitative analysis software (Melbourne: QSR International; Version 11). Researchers reviewed transcripts collaboratively to discuss differences in coding and interpretation. A smaller list of cross-cutting themes was compiled and discussed, and data were recoded into these categories. These were presented to key stakeholders for feedback and discussion. The key stakeholders were from the same organisations as those of the healthcare provider participants, but they were not necessarily the same individuals who were interviewed. Ethics approval was granted by the UNSW Sydney Human Research Ethics Committee Executive (HC15735). Relevant descriptive information was collected about the 18 participants, as shown in Tables 1 and 2. Each participant was identified using a code: S1–9 for healthcare providers and P1–9 for patients. Asylum seeker participants were from Cameroon, Guinea, Malaysia, Russia, Sri Lanka and Turkey. The ad hoc process of transition from asylum seeker–specific primary care to mainstream primary care was characterised through interviews and discussions with healthcare providers. Figure 1 outlines the general pathway described by participants. Some patients readily accepted the need to transition, but others were strongly opposed, and some continued attending asylum seeker–specific primary care. For those willing to transition, a mainstream GP was identified through personal networks or with assistance from ASC staff. When staff helped patients to find GPs, they sought an appropriately located doctor who spoke the patient’s language and offered bulk-billing. Often, staff had ongoing contact with former patients to supply free medications; assist with booking appointments; and help with casework, employment guidance and food. Many patients reported dissatisfaction with their mainstream GP, and some sought out a different GP or returned to asylum seeker–specific primary care. Other catalysts for returning to familiar services included loss of Medicare access or SRSS assistance and difficulty accessing mainstream care. The ASC does not have an established process for transferring medical records to mainstream GPs. Staff usually waited until GPs made contact to ask for records. Most patients interviewed were unaware that transfer of records might be required, or did not know whether it had occurred. Interviewees regularly recounted examples of disrupted access to Medicare because of expiry or policy changes. Medicare instability resulted in severe physical and mental health consequences in numerous cases. These disruptions to access affected the abilities of asylum seekers to maintain independent interactions with the health system. The instability caused patients to return to asylum seeker–specific services, creating administrative and resource issues for already strained services. Patients and healthcare providers communicated frustrations about the complexity of the health system and the difficulties encountered by patients learning to navigate it. Healthcare providers emphasised the need for changes in the system to better support patients with complex health and psychosocial issues. Many patients received healthcare and support from multiple organisations, and difficulties arose in communication and integration between services. This resulted in patients receiving fragmented care, and fostered a sense of confusion. This affected the transition process significantly. Healthcare providers reported a smoother transition when there was an integrated transition with communication between all relevant services. The ASC provides a comprehensive and adaptable service model for patients, which helps foster a sense of inclusiveness and security. This model is quite different from mainstream general practice, in which set appointment times and procedures are the norm. Many healthcare providers acknowledged that these differences played a role in the development of over-reliance on asylum seeker–specific services, and compromised the opportunity for patients to develop vital health literacy skills required for independent interaction with mainstream services. Some interviewees characterised the relationship between the ASC and its clients as one of parent and child. Although this demonstrates the strong sense of belonging and support that patients felt at the ASC, it also contributed to reluctance to transition to mainstream primary care. Transition to mainstream care presented an opportunity for patients to become more independent. This produced mixed feelings among many asylum seekers. Many patients continued to attend asylum seeker–specific primary care despite having Medicare eligibility and theoretical access to mainstream primary care. Many who did transition required ongoing support to navigate the health system, organise appointments or access free medications. This burden of ongoing management affected the capacity of the service to meet the needs of new Medicare-ineligible patients. Healthcare provider interviewees frequently identified the key role they could play in managing the transition process for and with patients. This involved two key components: managing communication with the mainstream health provider, and managing the expectations and skill development of the individual or family making the transition. Interviewees frequently identified that mainstream GPs did not have a good understanding of issues affecting asylum seekers, including physical and mental health issues, social circumstances, and access to entitlements such as Medicare. Factors reported to contribute to this lack of understanding included infrequent contact with asylum seekers, and sometimes dismissal of mental illnesses such as post-traumatic stress disorder (PTSD) as political rather than mental health issues. The lack of understanding frequently manifested as insensitivity to asylum seekers’ concerns. Additionally, healthcare entitlements were often a source of confusion. SRSS providers had some clients who were eligible for primary care services despite not having Medicare access. Payments to healthcare providers were made by the SRSS provider, rather than by Medicare. The process of billing the SRSS provider and waiting for payment was unfamiliar and time-consuming for healthcare providers, resulting in resistance to taking on asylum seeker patients. Patients and healthcare providers expressed the need to educate GPs about these issues. Some information sessions about refugee health issues had been organised by the local Primary Health Network (PHN) and the RHS, but attendance at these was low. Patients commonly highlighted the difficulty of finding a GP they felt they could consult with on an ongoing basis. Many attended high-throughput, bulk-billing practices for isolated issues in an episodic fashion, but did not develop sustained doctor–patient relationships. Patients frequently expressed the importance of having their own personal GP, but were unsure how to find one. This often meant that only acute health issues were addressed, while preventive care was neglected. Interviewees reported considerable variability in how patients coped with the transition process. Those who transitioned to mainstream care more easily often had better English language proficiency, good general literacy skills, and greater independence and ability to self-advocate. Patients who experienced more difficulty tended to rely more heavily on asylum seeker–specific services, and often had more severe mental illness affecting their memory, concentration and organisational skills. Almost all interviewees identified difficulty understanding the Australian health system as a major issue. Concepts such as the gatekeeper role of the GP, specialist referral processes and obtaining prescriptions were often unfamiliar to asylum seekers, particularly when newly arrived. Staff of asylum seeker–specific primary care services provided explanations to patients about relevant aspects of the health system as required, but there was no systematic process for conveying this information to all patients. Numerous interviewees suggested methods to improve patients’ understanding, such as an information booklet or workshops. The substantial levels of mental illness experienced by asylum seekers affected their ability to cope with the logistical aspects of the transition. High instances of PTSD affected concentration, memory and organisational abilities. In addition to logistical barriers, mental illness affected patients’ ability to establish trust in unfamiliar health professionals. As a result, patients often returned to asylum seeker–specific services. For many asylum seekers, issues such as accommodation and finances were more immediate than health issues, and hence took precedence over managing their transition into mainstream primary care. Social and financial circumstances affected living conditions, and subsequently affected patients’ physical and mental health, and their ability to interact with health services. Numerous patients became eligible for Medicare but did not receive work rights. Despite transitioning to mainstream care, they continued to rely on the ASC for access to free medications (not incurring the copayments required under Australia’s Pharmaceutical Benefits Scheme). This ongoing financial dependence on the ASC limited the ability of individuals to manage their own healthcare. It also placed strain on the finite financial resources and staff capacity at the ASC. The reported experiences of asylum seekers and their healthcare providers demonstrate that transition to mainstream care is often difficult and confronting. 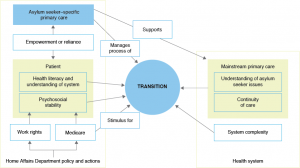 Figure 2 outlines the interdependent factors affecting the success and ease of the transition. The comprehensive and welcoming nature of asylum seeker–specific services promotes acceptance, but also facilitates dependence in some patients. To reduce reliance on asylum seeker–specific services, patients need to be prepared to integrate into the mainstream health system well before the transition.7 This may conflict with providing for a patient’s immediate needs, and put a significant burden on asylum seeker–specific health services. However, not preparing patients for the transition creates an even greater burden, because patients end up continually reliant on resource-limited services. The repeated gain and loss of Medicare benefits affected patients medically and psychosocially, reducing their ability to navigate the health system and cope with the transition process. Ensuring continuity of Medicare access would reduce physical and psychological harm to asylum seekers, and relieve some of the burden on asylum seeker–specific health services. Mainstream primary care providers often lacked understanding of asylum seekers’ entitlements, and their health and social issues, as has been previously identified.15,21–23 Asylum seeker–specific services and PHNs must work synergistically to educate mainstream GPs about asylum seeker health issues and support GPs who have asylum seeker patients. 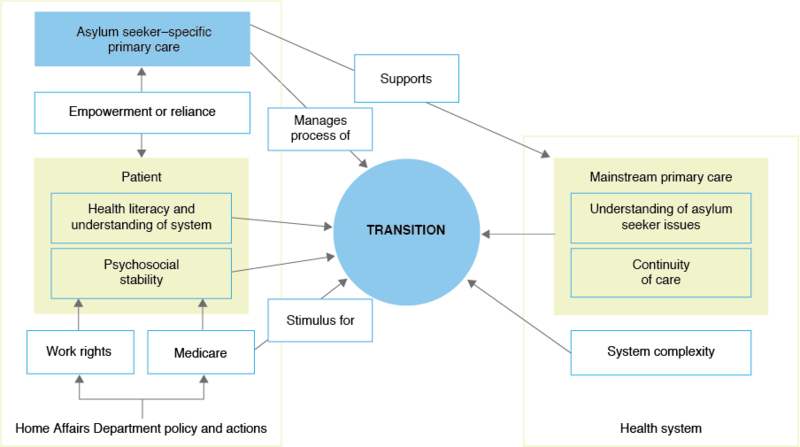 Figure 3 outlines a potential framework for the transition process, developed in consultation with ASC staff. This study was potentially limited by recruitment through a single centre and the location of the interviews. Despite the small sample size, thematic saturation was reached. Significantly, this study investigates the views of asylum seekers themselves about the transition process. Future research could further explore the prevalence of these views among the asylum seeker population, and the perspectives of mainstream GPs receiving asylum seeker patients into their practices. Transition from asylum seeker–specific to mainstream primary care is a complex process. Significant problems occur because of the nature of the relationship between patients and asylum seeker–specific services, deficiencies in the process of transition, psychosocial pressures, and lack of accommodation of asylum seekers by some mainstream providers. Asylum seeker–specific services need to increase understanding of the health system and health literacy among asylum seekers. Mainstream primary care providers need to be supported to increase their understanding of, and sensitivity to, asylum seeker health and psychosocial issues. This could be achieved through partnerships between asylum seeker–specific health services and PHNs. © 2018 Fair et al. This work is licensed under a Creative Commons Attribution-NonCommercial-ShareAlike 4.0 International Licence, which allows others to redistribute, adapt and share this work non-commercially provided they attribute the work and any adapted version of it is distributed under the same Creative Commons licence terms.